It is the first Fatimid mosque in Cairo, built by Jawhar Al-Sekelli commander of the armies of Al Moez Le din Allah, in the year 972 A.D. Named after Fatma Al Zahraa, daughter of the Prophet Mohamed. Al-Azhar is one of the earliest Islamic universities and regarded as the seat of learning for students from all the Islamic countries of the world. The first lecture was given there in 975 AD. It is still regarded as the school of Imams and leaders of the political revolution and religious reform movements. Al-Azhar has witnessed renovations and improvements throughout the ages. It consists of an extensive central open space “sahn” surrounded by wings. 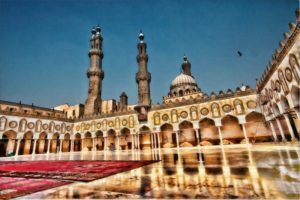 The mosque has three minarets, one of which is a twin minaret from the age of Sultan Al-Ghouri Al-Azhar Library contains more than sixty thousand volumes, of which fifteen thousand are manuscripts.